Palazzo Mondrian is a spacious very well laid out and luxury Italian villa. It's furnished in a contemporary style maintaining all the original features, beams and stone floors. This charming property has even its own private chapel decorated with frescoes from 1800s. Palazzo Mondrian is located at the end of the very quiet, rural hamlet of Lugnano but completely private and secluded. The house has its own independent entrance courtyard to ensure maximum privacy for guests. Palazzo Mondrian consists of three floors with an internal stone staircase of great interest. The property is surrounded by a private woodlands boasting 6HA, with a private swimming pool (7.5m by 4m) located in the grounds, there are sun loungers and a large patio adjacent. The garden ensures much space for sports, (some equipment is provided) such as table tennis, bocce, badminton for clients use. From the garden you can admire a beautiful view of the surrounding areas and the lush Tiber Valley. 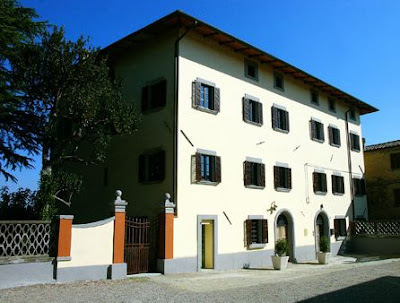 The palazzo is situated on the Tuscan Umbrian border, very well positioned for visiting the most beautiful sites of Umbria and Tuscany, for example- Gubbio, Perugia, Assisi, Sansepolcro, Cortona, Siena. The market towns of Città di Castello, Umbertide and historic Montone are all within about 20 minutes away from Palazzo Mondrian. In addition to the considerable and stunning settings, courtesy of the geographical position, the property has an extraordinarily spacious feelings. This spacious very laid out and luxury villa, is also equipped for babies, cot, baby chair, downstairs bathroom are all available. Chapel, lounge area, breakfast room, kitchen, disabled bathroom with walking shower with direct access for wheelchair, toilet room, laundry room. Middle hall leading to 2 double bedrooms each with ensuite large bathrooms with shower and bath tub. One of the first floor bedrooms is best described as the second master bedroom, large floor space, double large wardrobe, and bathroom with a central standing modern coral bath tub. 1 master bedroom with ensuite bathroom designed by Philippe Stark with shower and central standing bath tub, 1 double bedroom with sitting area and ensuite bathroom with walking shower and bath tub, 1 double bedroom with ensuite bathroom with bath tub and over head shower.